SPIRIT 1 & 2 are on-line and available for booking. Step 1: A login is required to access SPIRIT. Step 2: Check the local weather conditions. 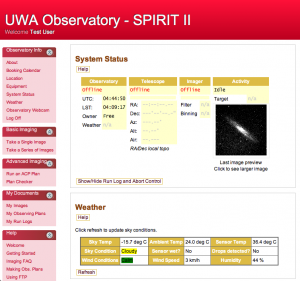 Step 3: Check the telescope bookings calendar for availability. Step 4: Make a booking request. Note: The weekend booking deadline is Friday morning.